This two-volume book presents social cohesion and demographic challenges that are associated with low birth rates and population ageing. It does so from the perspective of citizens and key policy actors. The work analyses peoples’ attitudes about demographic trends and expectations towards private networks and public policies. It places these in the societal context of national specificities in fourteen countries and regards them as part of the dynamics of the European integration process. Volume 1 focuses on research findings related to family issues. Its main topics are: attitudes towards family and family change, value of children, fertility intentions, and views on work-family-balance. Particular attention is given to the acceptance of and expectations about family policies. Additionally, the reader finds methodological and theoretical chapters and learns about the background of the DIALOG project. 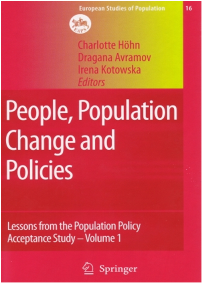 The methodological part written by Dragana Avramov and Robert Cliquet provides the reader with a detailed description of opportunities to analyse the Population Policy Acceptance Study database (the database is attached on CD-Rom in Volume 2).